Dmitri Mendeleev was a Russian scientist who is best known for creating the Periodic Table of elements. He was born in Siberia in 1834 into a large and reasonably well-off family. His surname is sometimes spelled Mendeleyev or Mendeleef. When his father went blind and could no longer work, his mother revived a glass factory that the family had once owned. She built it into a successful business again. When Dmitri was 14 the glass factory was destroyed in a fire. Shortly after, the family moved to St. Petersburg. Here Dmitri would receive a good education at the Institute of Pedagogy. This was a big decision, requiring a trip of about 4,000 miles. His mother died soon afterward. 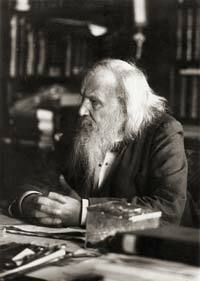 Shortly after graduating from the Institute, Mendeleev contracted tuberculosis, often a fatal disease at the time. He moved to the Black Sea in hopes that the climate there would aid in recovery. Here he obtained a position as a science teacher at the Simeferopol Gymnasium. He remained there for two years, returning to St. Petersburg in good health in 1857. Mendeleev quickly established a reputation as a formidable scientist for his work in a number of fields, including spectroscopy and the capillary action of liquids. In 1864, he was made professor at the Saint Petersburg Technological Institute, and the following year became professor at Saint Petersburg State University. His reputation began to spread outside of Russia, and he received many honors and awards from foreign institutions, including the Copley Medal, bestowed on him by the Royal Society in London. In 1890, Mendeleev relinquished his educational posts, moving into the commercial sector, where he conducted research in petrochemicals. During this period, he became Russia’s Director for Weights and Measures. In this role, he developed a standard for the quality and production methods of vodka. Mendeleev was made a member of the Royal Swedish Academy of Sciences in 1905, and the following year there were significant efforts to have the Nobel Prize for Chemistry presented to him. However, some influential individuals were opposed to him receiving the prize, and it went elsewhere. Attempts to have the prize awarded to him the following year were also unsuccessful. Mendeleev had begun working on a better system for classifying elements as early as 1863. At the time, most chemists used one of two systems to classify elements. These were ordering them by atomic number, or ordering them by their properties. In 1869, Mendeleev tried to determine if it was possible to combine these two systems into a single system. He constructed a table, after much experimentation, where elements were ordered by their atomic number in horizontal rows, which he called groups, and by their properties (specifically electron valence) in horizontal rows that he called periods. When he built his table, there were gaps in it, and Mendeleev correctly predicted that these gaps would one day be filled by elements yet to be discovered. Mendeleev’s Periodic Table has undergone some minor changes, but fundamentally is unchanged, and it was a remarkable scientific achievement.